So, a while back I shared about a 4×6 art card swap I’d participated in that used several different techniques: collage, embossing, watercolor pencils, and word art. Well, after that post the Blond Duck herself (of A Duck in her Pond and Words & Whimsy) asked for a tutorial and while it took me a little longer to get to this than I’d planned, I’m happy to say I finally bit the bullet this weekend and created a similar card and filmed the entire process. I still have a bit to learn when it comes to making these sorts of process videos, but I hope this helps disspell some of the “mystery” of heat embossing, watercolor resist and collage for those who haven’t given it a try yet. There you have it. Any questions? The entire process, start-to-finish, took about half an hour. Some parts took longer than usual because I was explaining for the benefit of the camera, but then I also don’t show the time spent flipping through the magazine looking for words and images to use. So 30 minutes is about right. 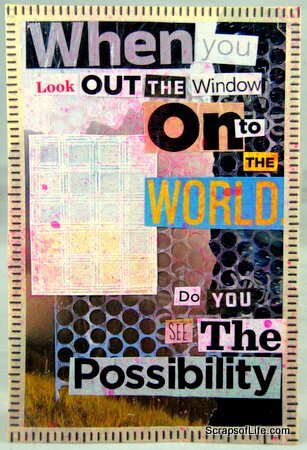 A 4×6 art card is one of those great instant-gratification projects and I hope you’ll give it a go and, even more, hope that you’ll share what you’ve been up to. Now that I’ve finally gone and done this first video, I’m kind of excited to do more and will try to plan ahead enough on future posts where it might be appropriate. That said, I’m also open to requests, so just let me know if there’s something you’d like to see explained a bit more, demonstrated, or just a bird’s eye view of and I’ll do my best! Oh, and in the spirit of true confessions, I committed one of my crafter’s pet peeves and I can’t believe I did it. During the course of the 30 minute video I must have said Mod Podge a few dozen times (some during those sped-up portions where you are spared my blathering) and, upon play-back, I heard myself (just once–but it was enough) call it “Modge” Podge. I thought about going back and dubbing the right word in, but I figured I might as well leave it and fess up rather than spend ages trying to get a seemless fix in place. Oh, I love you! Thanks so much! Have you seen the Brave Girls Blog? I’ve been wanting to take their soul book class and this will be a nice little practice for me! Thank you!